Built in 1916 to house Emory’s theology school, Convocation Hall has now reopened after a historic restoration. 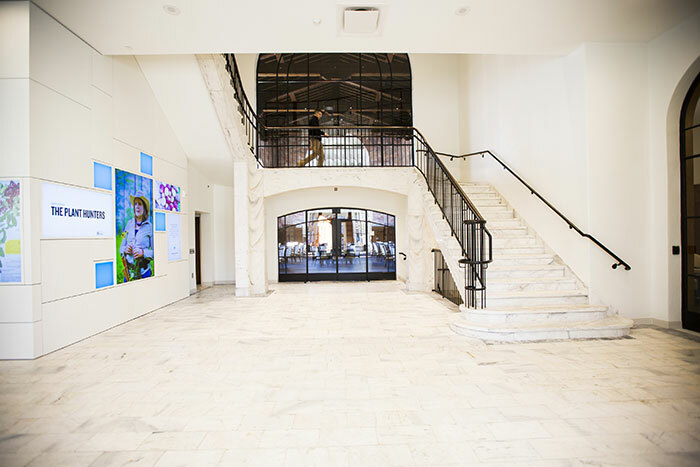 The original chapel, divided by steel mezzanines when the space was part of the Pitts Theology Library, has been restored to serve as a space for select university events. The foyer highlights how Convocation Hall celebrates Emory’s past and present, featuring both 100-year-old marble stairs and digital displays showcasing current stories of Emory’s impact. The first public event in Convocation Hall will be an open house from 3-4 p.m. on Thursday, Feb. 7, with student docents leading tours of common spaces. Then, on March 7, Conversations on the Quad moves indoors for a discussion about honor led by Oxford College Dean Douglas A. Hicks. 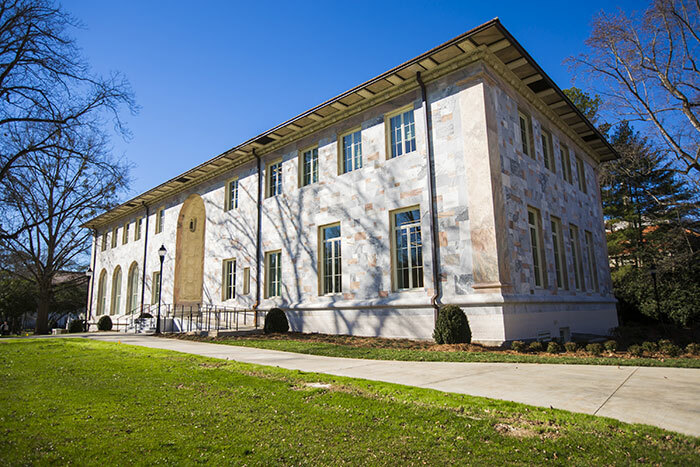 Originally constructed more than a century ago, one of the first buildings on Emory’s Atlanta campus is now open after an extensive renovation, ready to once again serve as a hub for community, leadership and scholarship. The marble building on the main quadrangle, known as the theology building for most of its history, is now named Convocation Hall. It officially opened at the start of the spring semester, and will host an open house from 3-4 p.m. on Thursday, Feb. 7, with student docents leading tours of common spaces. “Convocation Hall is in the fabric of Emory and will always be, so it was extremely important to restore it to its original stature and make it a centerpiece of Emory’s campus, just as it was back in 1916 when Emory moved from Oxford to Atlanta,” says Matthew Early, vice president for campus services. Emory College was founded in 1836 in Oxford, Georgia, where Emory's Oxford College is now located. Coca-Cola Company founder Asa Candler donated money and land in Atlanta for the university to expand, and in 1915, the Superior Court of DeKalb County granted a charter to Emory University. Convocation Hall was completed in 1916 as one of the first buildings on Emory's Atlanta campus. It is part of the Emory Historic District, which was listed on the National Register of Historic Places in 1975. First designed as the home for the theology school, in its early years the building served a variety of additional uses, including offices for university leaders like the chancellor and the college dean. For decades, it was the home of the Candler School of Theology and the Pitts Theology Library, until they moved into new buildings. 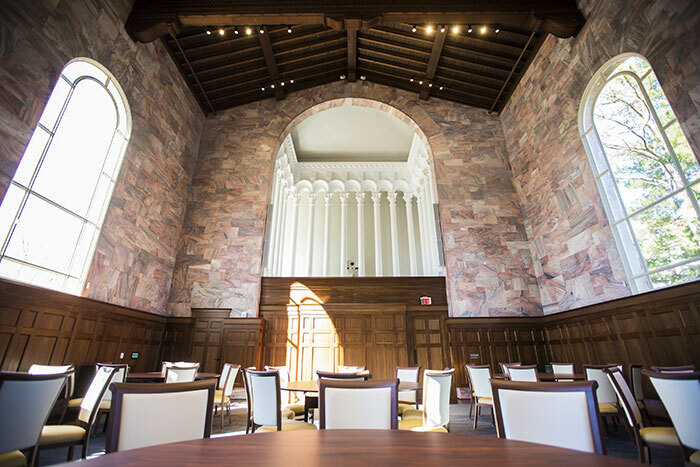 Convocation Hall now features spaces for significant university gatherings, including the original reading room and chapel, which combine state-of-the-art technology with restored architectural features. The University Senate and Administrative Council plan to host a spring meeting there as well. The renovated building also supports Emory’s mission by providing space for the offices of the president, advancement and alumni engagement, business and administration, the vice president and secretary, general counsel, and communications and public affairs. The collaborative and flexible workspaces allow for greater cooperation among these central functions to advance the “One Emory” vision. Another public event will be held in Convocation Hall on March 7, as Conversations on the Quad moves indoors for a discussion about honor led by Oxford College Dean Douglas A. Hicks. Convocation Hall will be available for select university events in late spring 2019. More information will be available on the Convocation Hall website at that time. 1. Oldest buildings: First known as the Theology Building, Convocation Hall was completed in 1916 and is one of the two oldest academic buildings on campus. 2. Mirror images: Originally, this building housed the Candler School of Theology, the chancellor’s office and an academic library. It is located across the Quad from the other original building on the campus, which was the first home of the School of Law, features similar design, and is now known as Carlos Hall. 3. Acclaimed architect: Designed by Beaux Arts architect Henry Hornbostel, Convocation Hall and Carlos Hall feature the Italian Renaissance style and pink and gray marble that defines the university's main quadrangle. 4. Creative carvings: While the two buildings are almost mirror images, Hornbostel added subtle, unique architectural details that reflect their original uses and can still be seen today. Tucked under the eaves of Convocation Hall are small ornamental carvings showing alternating religious images, reflecting its start as the home of the School of Theology; under the eaves of Carlos Hall, the carvings show the scales of justice and the Mosaic tablets of law, showing that it was the home of the School of Law. 5. Multiple uses: By the time Emory College arrived on campus in 1919, only two other academic buildings had been built, so through the years, the Theology Building also housed the College dean, the library, faculty offices, the post office and the Emory museum, among other uses. 6. Library levels: For most of its history, the building served as the home of the theology school and theology library. In 1974, the Theology Library’s collection greatly expanded with the acquisition of more than 200,000 rare books; it was renamed the Pitts Theology Library in honor of Margaret A. Pitts and the Pitts Foundation’s assistance in purchasing the collection. The interior of the Theology Building was redesigned to incorporate steel mezzanines in all the rooms. 7. Ripe for renovation: With the move of the Candler School of Theology into the Rita Ann Rollins Building in 2009 and the transfer of Pitts Theology Library into new quarters in 2014, the old building was left vacant and ready for a renewed purpose. 8. Preserving the past: Many of the building’s original features were preserved and restored in the current renovation, including the marble floors on the second floor, the distinctive pink marble walls in the Community Room (formerly the chapel space), paneling in the chancellor’s office, and a marble fireplace in the Candler Lounge restored to working order with gas-burning logs. Construction crews also found an old fireplace hidden behind drywall on the building’s lowest floor that has now been restored. 9. Looking to the future: The restoration added state-of-the-art technological capabilities and also brought the building into compliance with the university’s environmental standards; current mechanical, HVAC, fire safety and structural requirements; and compliance with the Americans with Disabilities Act. 10. What’s in a (new) name? Colleges and universities around the world have long celebrated the rhythms of academic life at special assemblies or convocations. The name Convocation Hall was chosen to celebrate this heritage and to revive the historic location for special community gatherings. Also, a gathering of eagles is called a convocation! To learn more, please visit the Convocation Hall website.